The body is scrubbed and waxed to a showroom shine, the trim is polished and the tires look like new rubber on sparkling rims. But now that your car is car is clean and gleaming in the driveway, don’t be so fast to put away everything you used to clean it. The end of summer means more attention and time will be spent indoors, and all those car care products can help make some of your household fall cleaning chores a little easier. Leather wipes. Yes, they are a quick and easy way to wipe down and clean the leather interior in your car. But leather wipes also work exceptionally well on leather furniture, cleaning and conditioning your sofa, love seat or easy chair to preserve that luxurious look. Glass cleaner. Tough enough to remove bug splatter from your windshield, automotive glass cleaner will do wonders to clean the grime from your windows, or wipe the fingerprints right off your glass tabletops. Multi-purpose cleaner. It works great on your dash and console, and gives your car the same look it had on the showroom floor. In your home, a multi-purpose cleaner will clear your fridge of fingerprints, keep kitchen counters clean and wipe away those sticky spots and food crumbs from the table. Carpet cleaner. The carpet in your car takes a beating. Salt in the winter, dust and grime in the summer. If an automotive carpet cleaner can cut through that mess, that spilled soda in the living room is a breeze. Using oxygen action, it powers through the toughest stains — coffee, ink, dirt — and penetrates deep into the carpet fibres to break up tough, ground-in dirt. Degreaser. As the temperatures get colder, it’s time to clean up and put away your outdoor summer furniture. The elements can do some harm, but an engine degreaser works wonders to clean grime off patio chairs and tables, and is excellent for a good fall cleaning of your barbecue. 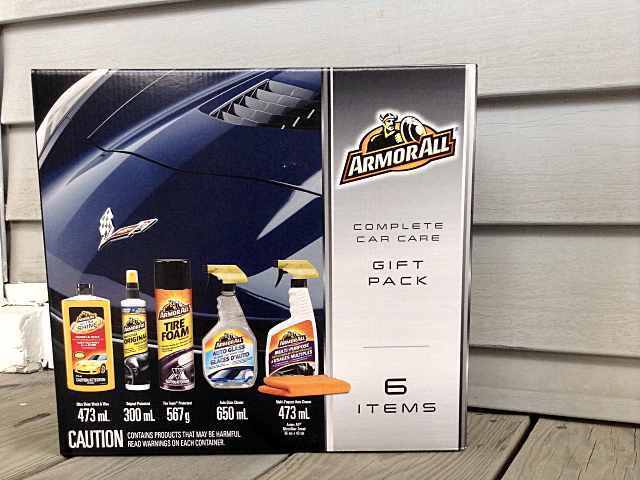 One of my lucky readers will win an Armor All 6pc Gift Box. Share in the comments one cleaning hack you currently use.